This week, I'm going to check out what the Candy industry does online. First up is Snickers. Obviously they're diving into the fun side of the candy pool(1). At first, like opening a real snickers, I thought I was in for some deep chocolate exploration (2). A minute later and I'm staring at an empty wrapper wondering where it went, but feeling oddly satisfied nonetheless. The little nougats, like mousing over the bush next to the fountain and sending an endless stream of tweeting birds into the brown sky, or the speakers and getting a Snickerlish quote, gives the site a playful tone, and gets me in the mood to explore more. However, there isn't very much content, even though it offers multiple ways to get to the same two sections. So there's 4 different types of Snickers, and Snickers sponsers NFL and Little League. Can I fly that helicopter up there? This is a perfect example of the clash between the business mind and the interactive creative. You end up with sites that become compromised mash-ups between the two instead of going all in to one side. And in the process, keep fueling the war over Flash use. If you want to have a fun, interactive site. Don't pull punches, go nutty (3). Make me find little thing after little thing until I find myself in my car going to get a Snickers. Make me learn all the ingredients to a Snickers incidentally, hide them in sound clips, under nooks and crannies. Or if you think paragraphs of copy are a necessity - don't put them in areas where you have to scroll a tiny window to read everything. Keep your Flash as a masthead, and build that content into the HTML below. Makes it a lot easier to get indexed by search engines. Beyond all that, there is one thing that stands out. 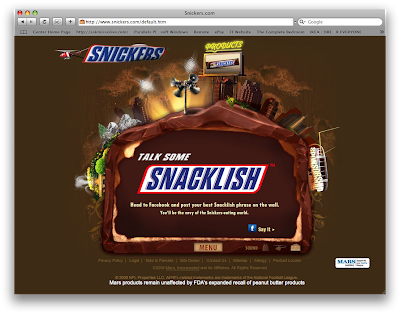 And it's the link to a facebook page for Snickers, where you can leave something on their wall. Over 40k fans so far. A little cursory poking around and I found this tidbit, after finding the tweeter that coincides with the article.